Ages 9 through 17. 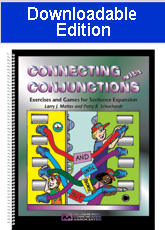 The games and activities in this book help students use conjunctions more effectively. The activities require the student to identify the appropriate and inappropriate use of conjunctions, to combine sentences, to add descriptive information, and to create stories in which conjunctions are used. Activities for coordinating conjunctions, correlative conjunctions, and subordinating conjunctions are included. Speech-language pathologists, special education teachers, and teachers in the general education classroom can use these activities with their special needs students. The worksheets may be reproduced. No shipping or handling charges are applied to downloadable products. This product is also avaliable in a printed book format (See related product option below).